A theater director whose edgy work angered traditionalists in the Russian establishment was placed under house arrest on Wednesday in a fraud case his supporters say is part of a government crackdown on artistic freedoms. Ignoring character witness statements in his favor from high-profile figures in the arts world and an offer from one to pay any amount of bail, a Moscow court ruled award-winning director Kirill Serebrennikov should be placed under house arrest until Oct. 19 ahead of his trial on embezzlement charges. The director, who has used his work to poke fun at the authorities, lampooning what he sees as the pernicious role of the church and state in Russian society, told the court he was innocent as supporters outside, including some of the country's most famous actors, chanted his name and demanded he be freed. "All the accusations made against me are absurd," Serebrennikov, 47, said from inside a metal cage in the courtroom. "I've been working honestly. I need to finish filming a movie and put shows on." But the court rejected his appeal to be freed on bail and granted a request from state prosecutors to place him under house arrest. 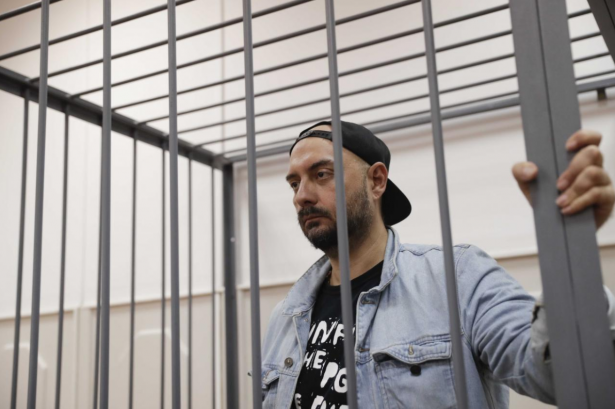 Investigators say Serebrennikov led a criminal group and embezzled at least 68 million rubles ($1.15 million) in state funds earmarked for an art project. Culture Minister Vladimir Medinsky was quoted by state-run RIA news agency as saying of the case: "I know for sure this is not a frame-up." Serebrennikov, art director at Moscow's avant-garde Gogol Center theater, faces up to 10 years in jail if found guilty. He says the funds were used to stage bona fide productions. His case has raised an outcry among the liberal cultural elite who say they fear the director is being persecuted for his work. In July, the Bolshoi Theater postponed the world premiere of Nureyev, an edgy ballet about the famous Russian dancer directed by Serebrennikov. The theater said the production was not ready. But the state-run TASS news agency cited a source close to the culture ministry as saying the production was postponed over concerns it violated a law designed to prevent the promotion of homosexuality to minors. "What the authorities are doing with him is a disgrace," Pavel Kaplevich, a theater producer, said after the ruling in Serebrennikov's case. "A great director of modern times is being treated like a terrorist." Writer and director Viktor Shenderovich said he thought the case was meant to be a warning to others. "This is a clear signal before the elections," Shenderovich told Russian broadcaster TV Rain. "(The signal is that) no global profile ... or elite will save you from the interests of a repressive state if it decides that it is in its interests to put you on the ground face down." Russia is to vote in a presidential election in March next year, with incumbent Vladimir Putin expected to run. Serebrennikov's supporters believe the authorities, in preparation for the vote, want to cow the liberal arts world into suppressing political criticism. Serebrennikov was working on a film about a Soviet rock star when detained. The conditions of his house arrest mean he will only be allowed to communicate with close relatives and his lawyers, and cannot visit his place of work without investigators' permission. A spokesman for the foreign ministry of France, where his productions have been presented, said Paris was concerned about his detention and hoped the case would be handled swiftly in line with the law. Serebrennikov's legal team said they would appeal.